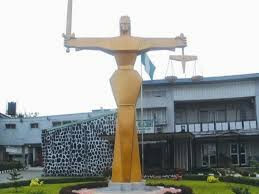 Today, an Abuja-based lawyer Kanu Godwin and his wife Adaku were both arraigned by police in a Wuse Zone II Magistrates’ Court, for allegedly assaulting a court bailiff while on lawful duty. He said that one Abdulsalam Maji of Federal Capital Territory (FCT) High Court Maitama, Abuja reported the matter at the station. He said that the complainant reported that while on official duty to serve court order at the defendants residence, the defendant and his wife attacked him and beat him up.